Go fossicking for the Yowah Nut, an opal unique to this region. 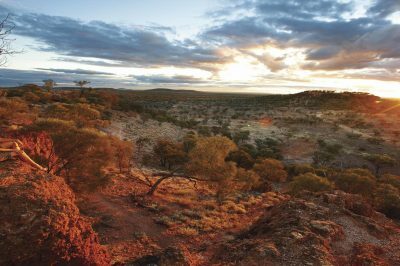 Relax in the hot artesian waters or lather on the mineral-rich mud for a truly outback-style pampering. Go fossicking for the Yowah Nut, an opal unique to this region. The small nut-like piece of ironstone may reveal nothing or a perfect opal at its centre. Relax in the hot artesian waters or lather on the mineral-rich mud for a truly outback-style pampering. Sample one of the town’s sweetest products, Yapunyah Honey. The Yapunyah tree flowers between April and October every year, producing winter honey dubbed the flavour of the outback. Come face to face with a giant wombat! Further evidence of Australia’s prehistoric past was revealed with the discovery of Diprotodon fossils in the area. Enjoy a relaxing picnic in the Lizard Lounge. Designed and painted to resemble a frill necked lizard, the lounge pays homage to the infamous world lizard racing championships previously held in Eulo. Many people visit the area during the cooler, winter months to search for opals in the surrounding opal fields. Eulo enjoys the Western Darling Downs’ dry, temperate climate. Milder temperatures from June through August, with pleasantly cool evenings are perfect for sitting next to an open fire. Temperatures are at their highest during the summer months (December through to February), with days regularly reaching the mid to high 30s. Settlement commenced in Eulo in the late 1800s. There is no agreement on how the town came by its name. Some believe it was named after a woman, while others claim it is a local Aboriginal word. The most infamous inhabitant of Eulo is Isabel Robinson – the ‘Eulo Queen’. Isabel migrated to Australia as teenager in 1868, where she found work as a governess on a station near Bourke. She was soon married to James McIntosh, the station’s overseer, stating on her marriage certificate as being born in England in 1851. McIntosh died soon after the wedding. The young widow met and married Richard Robinson 1871, however the details on this marriage certificate claim she was born in Mauritius. The couple moved to Cunnamulla in 1878, where they ran the store near the Cobb & Co stop. Shortly afterwards, the couple purchased the hotel relocated to Eulo. Isabel had a weakness for the fiery opals, building an impressive collection over the years. It was around this time the legend of the Eulo Queen developed and took hold. No one knows if Isabel came up with the royal title herself, or whether it was bestowed upon her by one of her many admirers. Isabel found herself widowed again in 1902, however married for a third time the following year. Well into her 50s, she wed 29 year old Herbert Gray, this marriage certificate claiming her age as 35. From 1913, Isabel spent several years living lavishly in Europe before returning to Australia. In 1926 her fortune had dwindled and she was living in poverty. Sadly, Isabel died in a mental institution in Toowoomba in 1929, with an estate estimated at a paltry £30. The hotel, still located in the heart of the small town, was named the Eulo Queen in honour of the strong-willed Western Queensland business woman.